K Vijaya Lakshmi, Chief, Transport & Communications Division, Mumbai Metropolitan Regional Development Authority explains how efficient management of lane traffic and congestion in peak hours can be brought with the help of kerb side bus lane corridor. main mode of transport are public transport, IPTs and Private Vehicles. Major arterial road i.e. 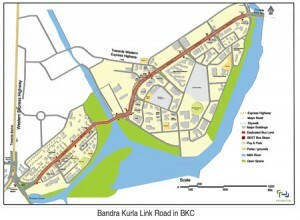 Bandra-Kurla Link Road (45 m) is the backbone of BKC area, and connects the other important Sion-Dharavi link road and LBS road. At present to access the Bandra Kurla Complex from Bandra / Kurla railway stations, countless autos and taxis are running in addition to overloaded BEST buses and the huge number of private cars which results in congestion during morning and evening peak hours. Considering the time required for construction for the metro corridors planned in and around BKC and to be operational, the traffic condition in BKC area will be further worsen and this triggers a very urgent need to put Kerb Side Bus lane in operation as a short term measure/attempt. 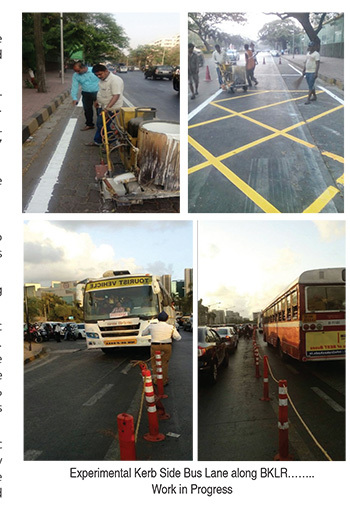 With an objective to minimize the traffic congestion occurring on BKLR in both peak periods by means of promoting kerb side bus lane, the feasibility study for Experimental kerb side bus lane was carried out through Mumbai Environmental Social Network in May 2015. This experimental project was implemented by Transport & Communications division of MMRDA in co-ordination with Traffic Police and BEST. The experimental kerb side bus lane has total length of 7.0 kms (3.5 +3.5) and covers 10 existing BEST bus stops. This bus lane negotiates nine critical junctions along BKLR. The ‘Kerb Side Bus lane along Bandra-Kurla Link Road’ for Single Decker buses was opened to public from April, 2016 and for Double Decker buses from May. To start the Double Decker bus operation, special permission was taken for trimming the tree branches along BKLR and operations were simultaneously. During the operation, the bus lane services suffered several hurdles like un-authorized vehicular parking, encroachment of the private buses/ vehicles, existing allotted parking stands for rickshaws, taxis etc. Shifting of boarding/alighting points of private buses from bus lane. The Kerb side bus lane alone carries 180 BEST and other private buses buses per hour and carries about 9800 passengers and the rest three lane carry about 5500 passengers. The average travel time from Kalanagar Junction to MTNL junction in peak hour reduced from 33 minutes to 15 minutes. Average speed of other vehicles have increased. These observations are supported by BEST officials, Traffic Police and the drivers from whom direct feedback was taken. Further it is also observed that volume and speed performance was achieved in spite of little weakness in discipline. There has been 23% growth in PCUs (person per car unit) and 29% growth in passengers in all lanes after the introduction of bus lane priority. At present MMRDA is in dialogue with BEST officials and Traffic Police to further improve the bus lane services. The success story of the experimental Kerb side bus lane was presented to the members of Core Committee of UMMTA wherein it was decided to extend it further to Bandra and Kurla station and look at other potential kerb side bus lane corridors in other parts of the City. The pilot study can be considered quite successful in terms of materially higher thrust at higher speeds especially for the buses. It has been shown that by efficient management of lane traffic, congestion in peak hours can be brought down.